Born at Segovia in Spain, 25 July, 1532; died at Majorca, 31 October, 1617. On account of the similarity of names he is often confounded with Father Rodriguez the author of "Christian Perfection", who though eminent in his holiness was never canonized. 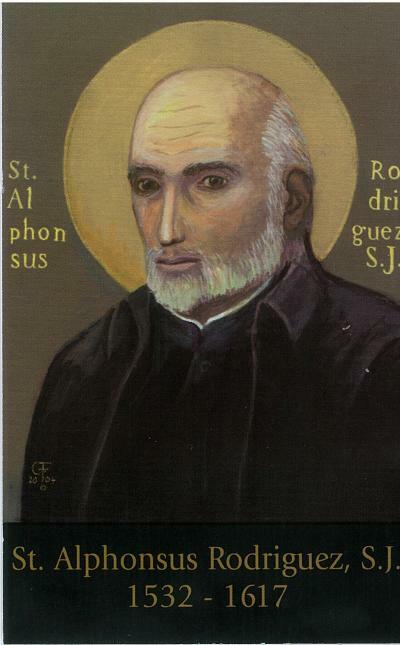 The Saint was a Jesuit lay-brother who entered the Society at the age of forty. He was the son of a wool merchant who had been reduced to poverty when Alfonso was still young. At the age of twenty-six he married Mary Francisco Suárez, a woman of his own station, and at thirty-one found himself a widower with one surviving child, the other two having died previously. From thattime he began a life of prayer and mortification, although separated from the world around him. On the death of his third child his thoughts turned to a life in some religious order. Previous associations had brought him into contact with the first Jesuits who had come to Spain, Bl. Peter Faber among others, but it was apparently impossible to carry out his purpose of entering the Society, as he was without education, having only had an incomplete year at a new college begun at Alcalá by Francis Villanueva. At the age of thirty-nine he attempted to make up this deficiency by following the course at the College of Barcelona, but without success. His austerities had also undermined his health. After considerable delay he was finally admitted into the Society of Jesus as a lay-brother, 31 January, 1571. Distinct novitiates had not as yet been established in Spain, and Alfonso began his term of probation at Valencia or Gandia -- this point is a subject of dispute -- and after six months was sent to the recently-founded college at Majorca, where he remained in the humble position of porter for forty-six years, exercising a marvelous influence on the sanctification not only of the members of the household, but upon a great number of people who came to theporter's lodge for advice and direction. Among the distinguished Jesuits who came under his influence was St. Peter Clavier, who lived with him for some time at Majorca, and who followed his advice in asking for the missions of South America. The bodily mortifications which he imposed on himself were extreme, the scruples and mental agitation to which he was subject were of frequent occurrence, his obedience absolute, and his absorption in spiritual things even when engaged on most distracting employments, continual. It has often been said that he was the author of the well known "Little Office of the Immaculate Conception", and the claim is made by Alegambe, Southwell, and even by the Fathers de Backer in their Bibliothèque de la Compagnie de Jésus. Apart from the fact that the brother did not have the requisite education for such a task, Father Costurer says positively that the office he used was taken from an old copy printed out of Spain, and Father Colin asserts that it existed before the Saint's time. It may be admitted, however, that through him it was popularized. He left a considerable number of manuscripts after him, some of which have been published as "Obras Espirituales del B. Alonso Rodriguez" (Barcelona, 1885, 3 vols., octavo, complete edition, 8 vols. in quarto). They have no pretense to style; they are sometimes only reminiscences of domestic exhortations; the texts are often repeated; the illustrations are from every-daylife; the treatment of one virtue occasionally trenches on another; but they are remarkable for the correctness and soundness of their doctrine and the profound spiritual knowledge which they reveal. They were not written with a view to publication, but put down by the Saint himself, or dictated to others, in obedience to a positive command of his superiors. He was declared Venerable in 1626. In 1633 he was chosen by the Council General of Majorca as one of the special patrons of the city and island. In 1760 Clement XIII decreed that "the virtues of the Venerable Alonso were proved to be of a heroic degree"; but the expulsion of the Society from Spain in 1773, and its suppression, delayed his beatification until 1825. His canonization took place 6 September, 1887. His remains are enshrined at Majorca.